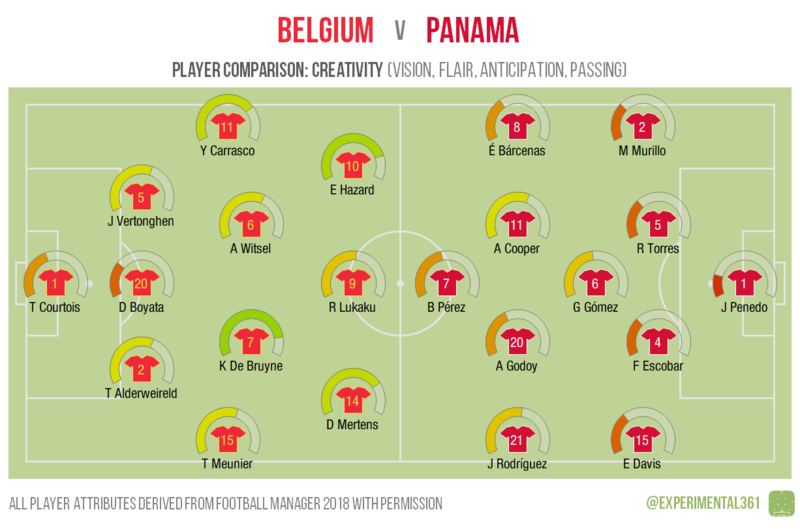 No surprises here really – Belgium look really strong on paper and even their potential weak link Boyata is more highly-rated than the best Panamanian player. Four of the underdogs’ squad stand out: Godoy and Gomez in midfield, Torres in central defence and the goalkeeper Penedo. 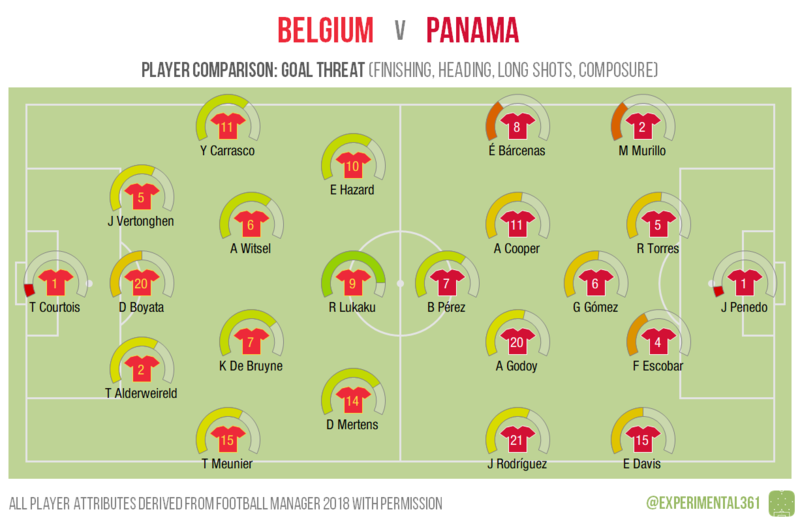 The two centre forwards are their respective teams’ best chances of finding the net, but it’s fair to say that Belgium have goals in them across the pitch. Panama meanwhile are likely to see either Godoy or Rodriguez pop up from midfield if Perez has an off day. It’ll shock nobody to learn that Kevin De Bruyne is the most creative player on the pitch, although again there’s no shortage of options in this Belgium side. Carrasco and Hazard on the left could combine to devastating effect if given room. 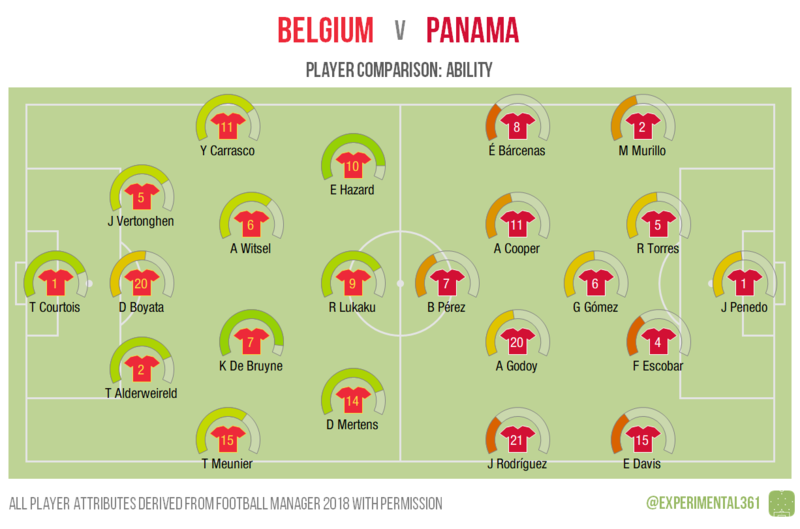 For Panama, Cooper in midfield is likely to be their conduit, although Rodriguez on left wing is also above-average in the guile department. The physical battle between Lukaku and Torres could be an interesting one whenever Belgium get the ball into the box, while at the other end a strong Belgian back three could make life difficult for Panama’s relatively slight attackers. While Perez, Godoy and Gomez can probably take care of themselves, the other three midfielders don’t look like they’re going to be barging anyone over this afternoon.